High Qualiy Advanced Whey Protein with whey protein isolates. Quick Mix, Great Tasting, Aspartame Free, Freeze Dried Strawberries. 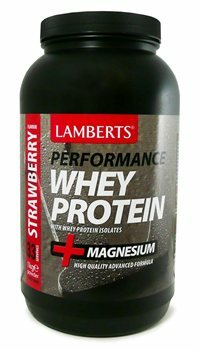 Protein Blend (Whey protein Concentrate* , Whey Protein Isolate*, with Emulsifier Soya Lecithin), Flavourings, Citric Acid, Thickiner: Sodium Carboxymethylcellulose), Natuaral Colour: Carmine, Freeze Dried Strawberry, Sweetener: (Sucralose).